Boboli Gardens | Travel to Florence.com, your online travel guide. The Boboli Gardens in Florence, Italy sit behind the expansive Pitti Palace, (Palazzo Pitti), and overlook the city of Florence. It is the most beautiful garden in Italy offering fabulous views, fountains, temples and classic period Medici works of art. Pitti Palace, built in the mid 1400's, was originally the home of a Florentine banker, Luca Pitti. Pitti Palace was sold to the Medici family in the 1500s and became home to the ruling families of Tuscany, amassing luxurious possessions such as paintings, plates and jewelry. In the late 18th century, Napoleon used it as home base and then it was used as the principal royal palace in newly united Italy. The Pitti Palace was donated to the Italian people by King Victor Emanuel III in 1919 and today it is Florence's largest art gallery, which is open to the public. 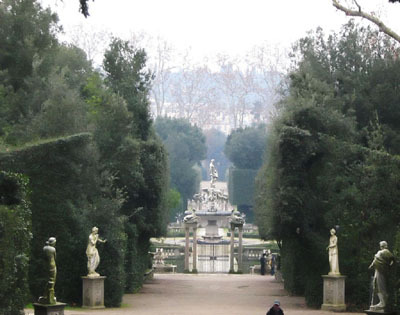 Boboli Gardens sits immediately behind the Pitti Palace. You can visit lavish statues from the sixteenth through the eighteen century, grottos and garden temples. The Tuscany influence is evident in the palace gardens, which features an amphitheatre that has stone walls flanked by Roman influenced statuary. 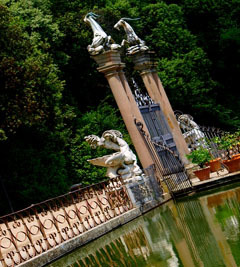 The extravagant Boboli Gardens were designed by Grand Dukes to hold lavish parties and celebrations. The fountain of Neptune rises in the middle of a pool that has luxuriant and natural plant life that has developed in recent centuries. You can have a picnic lunch on the benches that surround the pool, or any of the numerous awe-inspiring areas throughout the garden. It would be a great place for a wedding or special occasion banquet. You can also pick up refreshments at the 18th century coffeehouse on the way up to the top of the hill, where a formal garden that offers views of vineyards, olive groves and villas awaits. There are numerous shady walkways and wooded hillside pathways for leisurely scenic walks, and a way to escape the crowds of Florence. You can wander through the garden on the white pebbled path that meanders through cypress trees and Roman statues. The path eventually opens up into a large garden area that has an artificial lake and a Little Island. It's a romantic getaway, to say the least. 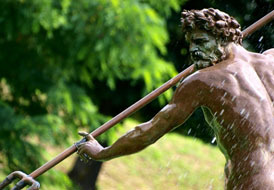 Since the Boboli Gardens does not have its own water source, an elaborate irrigation system was put in place that pumps water from the nearby Arno River to the garden's water features, fountains and pools. The Boboli Gardens overlooks the Arno River, the city of Florence and offers great photo opportunities. The Grotto of Madama and the Large Grotto are decorated with ornamental stalactites inside and out, sculptures and three successive caves. The Large Grotto originally housed Michelangelo's, Prisoners statuary, but has now been replaced with copies. Other rooms still contain Bathing Venus and Paris and Helen, original works by Giambologna and Vincenzo de Rossi, respectively. Address-Directly behind the Pitti Palace. Visiting Hours- Nov- Feb daily 9am- 4:30pm, Mar and Oct daily to 5:30pm, Apr- May and Sept daily to 6:30pm, June- Aug 8:15am- 8pm. Closed the first and last Monday of every month.